We take pride in every kit we made. Our Executive 72 Hour Survival Kit has been designed to provide maximum protection for you and your loved one when disaster strikes. All the survival basics are covered, including food, water, shelter, first-aid, light, heat, sanitation, communication, and more. Comes packed in a premium quality, heavy-duty nylon backpack so that everything is easily accessible when you need it and has plenty of extra room inside for a light jacket and spare set of comfortable walking shoes. 1 - Deck of Playing Cards (time occupier for kids & adult at shelter or if stuck at work or school. Helps time pass much faster). 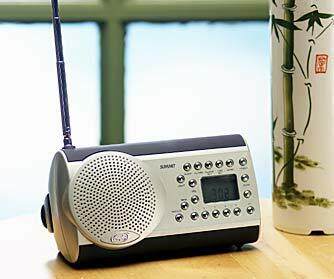 For a trip to the beach, or a global trek, this stylish, compact radio works anywhere in the world! Covers four radio bands, FM, AM, SW, and LW for local and world radio. It's powered by a rechargeable NiMH battery pack. Charge with the built-in solar panel, or with the built-in dynamo crank (30 seconds of cranking gives about 30 minutes of listening), or with the included AC/DC power adapters, that include world plug adapters. An indicator light shows optimum charging. Earphone socket included for private listening, or use the built-in speaker. 30 station presets are available; 10 each for AM and FM, 5 each for SW and LW, with precise digital tuning. Supplied with a shortwave antenna, worldwide travel plug adapter, an international shortwave guide, and a very nice travel pouch. Two-year mfr. 's warranty. Designed in UK, made in China. 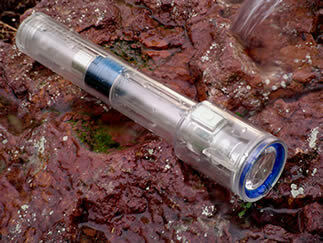 Size: 6.8"W x 3.5"H x 3.1"D.
Simple shaking recharges this revolutionary flashlight. It will always work, and there's a lifetime warranty. The Starlight uses a high output white LED light source and a precision lens. It delivers a 6-foot diameter illumination at a distance of 30 feet, like the glow of a full moon. Shaking the flashlight causes a high-power rare earth magnet to slide back and forth through a coil of wire, generating a small current. This electricity is stored in a capacitor, lighting the LED, and delivering up to five minutes of run time. Double O-ring seals allow use underwater or in severe weather. The casing is virtually indestructible recycled polycarbonate. Weighs 16 oz., measures 11" x 2". Lifetime manufacturer's warranty! Made in USA. Choose Black or Clear. Warning: Keep light at least 16" away from items sensitive to magnetic fields. The internal magnet is strong enough to wreak havoc w/magnetic storage devices, such as floppy disks, cassette tapes, etc. Product available and ready to ship.